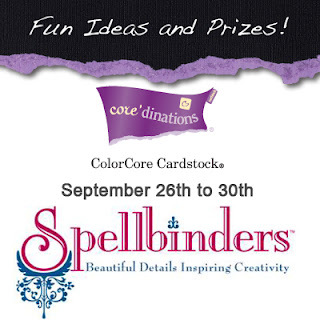 Welcome to the Core'dinations and Spellbinders Blog swap!!! Are you ready for a week long blog swap filled with loads of inspiration? Well, you came to the right place. 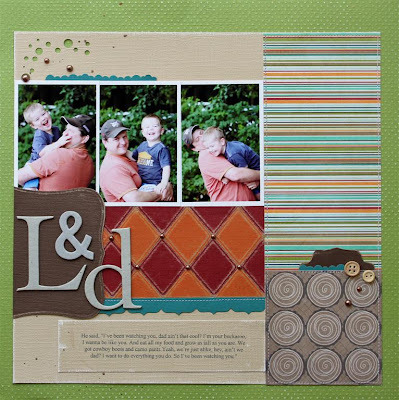 Spellbinders and Core'dinations have teamed up and created gorgeous projects just for you. But...a blog swap wouldn't be the same without give-a-ways, right? Core’dinations will be giving away FOUR paper packs in total!!! 1. Visit the Core’dinations blog and leave a comment every day, Monday the 26th through Friday the 30th. We will give away two packs to TWO lucky winners. 2. Like us on Facebook and comment to win a paper pack. 3. Visit the Core’dinations Designer’s blogs and leave a comment. We will be linking them up on the Core’dinations blog throughout the week and will choose one random designer’s blog to pick a winner. Make sure you visit the Spellbinders blog for more details on how to win some of their awesome dies. For my layout I used the diamonds nestabilities and Labels 8. I love love love this shape and used it in 2 ways, one to create a place to house my title. and the other for this label, I cut out the shape and then used a tag punch, this gave the tab a few more curves. The diamonds are cut out of the new Core Kraft and I love how you can create the embossed edge to sand. you know I totally love this one Lydia...and I have to say those diamonds rock big time! Great layout - love all of the little details! Great LO. I really like that diamond pattern you created. Wonderful layout and amazing design...especially the diamond pattern you created. What a fantastic page! I love those diamonds and your composition is wonderful. Super cute. Love that diamond pattern. Love the look of the whole layout overall. Great LO, I love the colors! beautiful layout with clever use of circle and diamond motif! What a great layout. I love those diamonds. I never saw these before. TFS. Great Layout - loved it! Great layout! I love the diamond part! LOVE your LO and you've inspired me now to use those diamond dies I wasn't sure I needed, but I had a coupon! Now I know I DID need them -- LOL!!! This is such a great layout! I love it! I love that diamond pattern! I really want to try this on my next layout or card. Wonderful layout, love the details with the sanding and stitching, thank you so much for sharing. Fantastic page and great use of the papers! Wow, fabulous page! Those diamonds look amazing! Love your layout, thank you for sharing it. Lydia, this is SO fantastic!!! I really like the technique you used on those squares. Thanks! Great LO! Love the diamond pattern and the swirly circles! Thanks for sharing. Wonderful page! Love the diamond pattern you've created - such great texture, too! Great layout. I like the diamond pattern. The diamond pattern looks great! Super layout, I love the movement with the diamonds and circles...it's a great guy layout! Great layout with the diamonds! Loving the colours of the Kraft Core'dinations. Those diamonds are so striking! Great layout! I love all the detils. Fabulous layout with these products. Absolutely wonderful layout, love all the great little details!! Great layout. Love the textures. wonderful page - great pictures! Great idea using the two colors for the diamond pattern! Gorgeous page! Thanks for the inspiration! Ok, those diamonds are awesome! 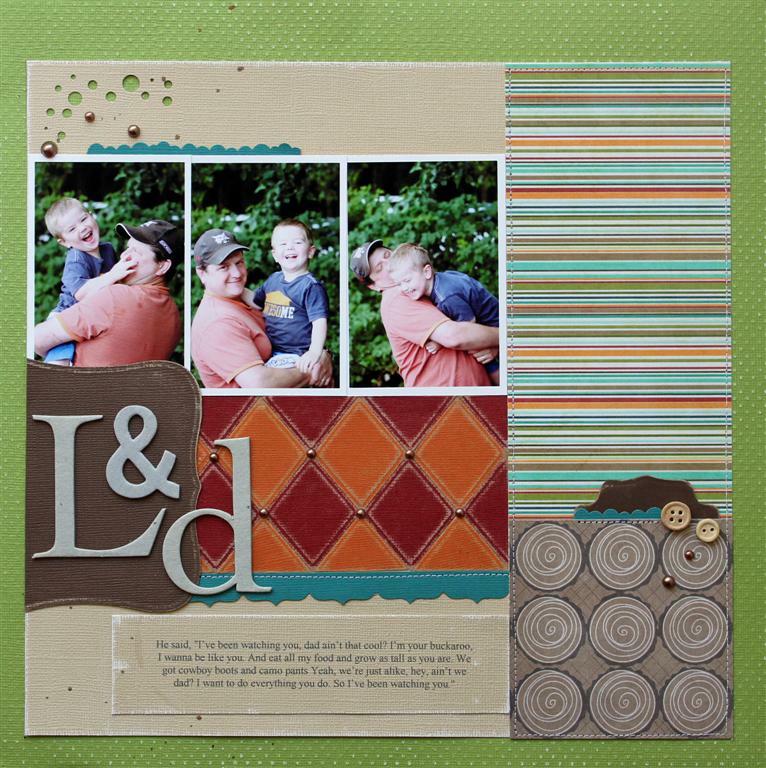 Great layout and wonderful ways to use such fun products!! The harlequin pattern is superb!! Those contrasting diamonds add some punch! Very nice.. love the circle swirls and the diamonds! Adorable LO. Love the diamond pattern and circle swirls!! This is AMAZING Lydia!!! I loved every piece of it! I have always been fond of the three-picture layouts like that were you get to see the same scene in different views. Great job! Great layout, Lydia! What a fun blog hop ~ so much inspiration. Love the swirls and diamond textures here.